Prototype: Privately owned type Gllmhs 37 "Leig-Einheit" painted and lettered for Ernst Paul Lehmann Patentwerkes in Nürnberg, used on the German Federal Railroad (DB). The cars look as they did in 1968. 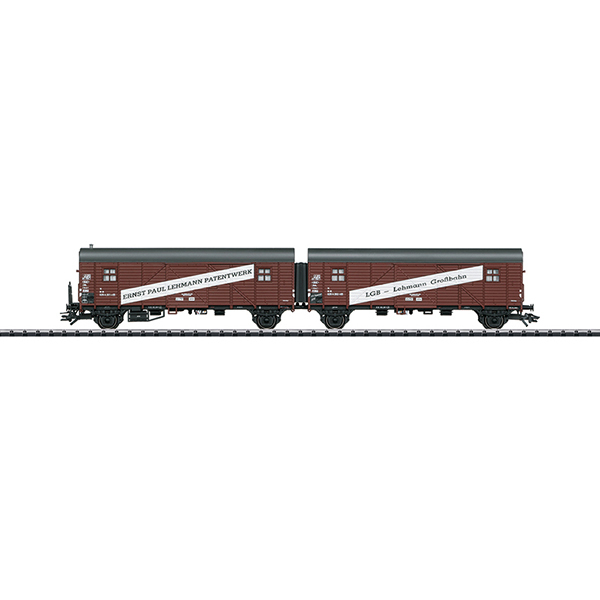 Light freight train unit for "Less-than-Car-Load-Lot" express service. Model: Both cars are permanently coupled together and are connected by a diaphragm. The cars have detailed construction with large format imprinting on the sides. This model is for the 50th anniversary of LGB. Length over the buffers 26.6 cm / 10-1/2". AC wheel sets: 4 x E700150. LGB pin included for the anniversary "50 Years of LGB"
One-time series. Available only at the Marklin Museum in Goppingen.